The holiday season is upon us. This time of year is filled with holiday parties, greetings, and feasts. It’s also a prime time to put your flooring to the test. Although laminate is ultra-durable, risks for laminate flooring damage are abundant this time of year. With spills, scratches, and scuff marks happening in overdrive, you are about to put your flooring to the test. To keep it looking like new for the rest of the year, here are a few tips to avoid those holiday hazards. When grandma has had a few too many glasses of eggnog, she might be more likely to tip it over and forget about her spill. Water and liquid can cause serious damage to your flooring if you don’t clean up a spill right away. 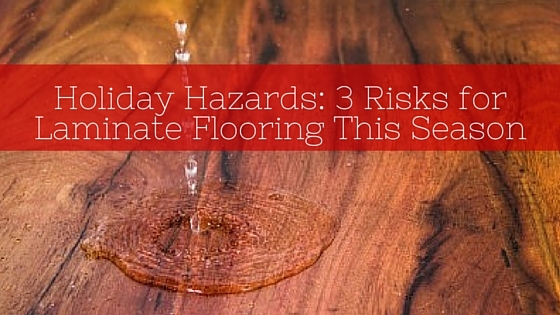 Your floors might warp or buckle if water sits for too long. As your guests indulge in holiday treats, offer a friendly reminder to clean up spills quickly to avoid slips, falls, and damage. ‘Tis the season to get dressed up in high heels and fancy clothes. This means that your guests could leave scuff marks and scratches as they scurry in and out from the cold. If your laminate flooring gets a scuff mark or two, clean it up using a damp cloth and acetone nail polish remover. This will usually remove the tough stain and get your floors back to looking sparkling and new. To avoid these issues all together, kindly ask people to leave their shoes at the door. Offer slippers or warm socks when they arrive to make them feel more comfortable! You appreciate the warm, cozy glow of candlelight but when things get a little bit too rowdy around your house, one spill and you could have candle wax coating your floors. This is not only a nuisance but it can also dull the look of your flooring if not cleaned properly. To clean up candle wax, use an ice cube or cool cloth to harden the spot. Then, scrape up the wax with a plastic scraper or credit card. Do not use anything sharper, such as a razor or knife, as you could scratch the surface. Once the bulk of the wax is off the floor, clean the area with a damp cloth. If your laminate flooring is damaged, don’t worry. Replacing laminate flooring planks is easier than you might think. By simply removing the baseboard or molding and the laminate flooring around the damaged planks, you can replace the damaged planks with new ones. 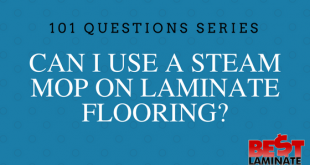 Check out our guide for replacing damaged laminate flooring for detailed instructions. While your guests are in town, enjoy their company worry-free!